I debated posting this peplum faille jacket because I didn’t get a smooth sleeve cap. But after looking through the many projects that I didn’t post or review this year (2015), I decided that this jacket was note worthy. Not every project is perfect, and it’s always good to share challenges with garment construction. Black polyester faille was ideal for my Burda 7495 peplum jacket. Unfortunately, it is sold out/no longer carried at Mood. But there are several other faille fabrics currently available. I have my eye on the black and white poke-a-dot on the first page. Faille fabrics are tightly woven ribbed textile. It has a glossy look, not shiny like most satins. If my memory serves me right, it was popular in the eighties. I had several outfits made with faille fabric. Burda 7495 comes in sizes 10 to 20. I used 14 with several modifications. 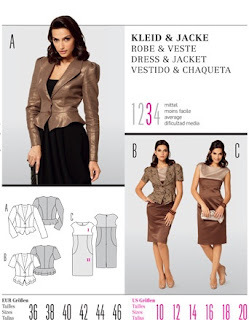 There are two jacket views: one with short pleated sleeves and a double peplum and the other is long pleated sleeves with a single peplum. Both are attractive to me. The shape of the lapel is flattering and the peplum gives me the appearance of curvier hips. The jacket went together with no problems, except for the sleeve cap areas on either side of the pleats. It’s not as smooth as I would like. Everything else was piece of cake. I did not like the placement of the second button, in the seam between the jacket and the peplum. So I moved the first button up a bit and put the second button about a inch or so above the peplum. So that’s about it for my review of this jacket. I’m considering making it again with long sleeves. This is my final review for 2015. Parting Shot: I stayed outside longer than two minutes. I’m so cold it hurts.